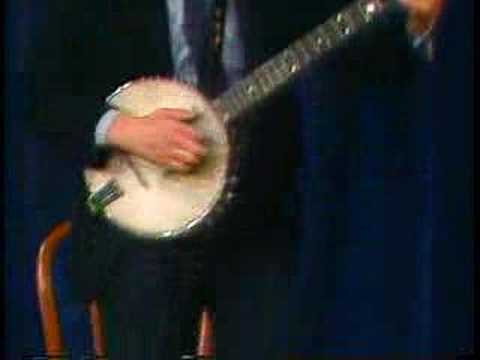 In May, 1979 a 26 year old musician in his hometown of Chicago opened a newly-minted one-man show with the intriguing title: Banjo Dancing, or The 48th Annual Squitters Mountain Song, Dance, Folklore Convention and Banjo Contest…and How I Lost. It was a farrago of traditional banjo tunes and songs, clogging and storytelling from Appalachia to Brooklyn. I happened to be teaching high school there at the time, where I had moved to become the next Steve Goodman or John Prine, and went to see it. It was the greatest night I have ever spent inside of a theatre—and the star, creator and just barely containable ball of energy on stage was Stephen Wade. Later that year he took the show to Washington, DC at the Arena Stage for a three-week run. Ten years later, when the show closed, Wade was standing on top of the record for the longest-running off-Broadway play in America. Over twenty years later and it is still one of the top five. Stephen Wade took the reverse path: starting with modern banjo techniques he assiduously buried himself in the vaults of the Library of Congress (the reason he chose to bring his show to Washington, DC in the first place) and started to retrace the route the banjo had taken from the African-American slave and minstrel show culture it spawned to the white mountain minstrels in the 1920s and 30s when the banjo first made its way into modern recordings. Starting out in Chicago was particularly fortunate for the journey he embarked upon. At Chicago’s Old Town School of Folk Music Wade became, with Fleming Brown as his mentor, a student of the revival of early folk banjo. In particular Brown introduced Wade to the music of Hobart Smith, whom they regarded as the best traditional old-time banjo player of all. In 1963, when Wade would have been just 10 years old, Fleming Brown taped nine hours of Hobart Smith’s repertoire in a home recording studio that may be the most significant single recording session in the world of old-time music. In Brown’s later years he bequeathed the entire collection to Wade, who, after Banjo Dancing closed, went back to where he had left off in 1979 as Fleming Brown’s most dedicated and determined student. He transformed the music on those tapes into his next show: In Sacred Trust: A Celebration of the Music of Hobart Smith. Wade also oversaw the tapes’ release as Hobart Smith: The 1963 Fleming Brown Tapes. That brings us to his current project—a new Smithsonian Folkways’ album called Banjo Diary—Lessons From Tradition, which is being released in tandem with the publication of Stephen Wade’s amazing new 500-page compendium by University of Illinois Press—The Beautiful Music All Around Us: Field Recordings and the American Experience. The book (reviewed separately) opens up the world of these classic old-time musicians who influenced and inspired Wade to carry on their music and life stories. This exquisite album demonstrates the lifelong durability of Wade’s musical sources, past banjo masters of frailing and of two- and three-finger styles which he has both thoroughly assimilated and recreated in ensemble arrangements that give them a lush grandeur that transcends their original string band and bluegrass underpinnings. Here is the track listing: 1) Cotton Eyed Joe; 2) Train 45; 3) Arcade Blues; 4) Uncle Buddy; 5) Cuckoo’s Nest/Temperance Reel/Hop Light Ladies; 6) Home Sweet Home; 7) Don’t Let Your Deal Go Down; 8) Old Country Stomp; 9) Rocky Hill; 10) Little Betty Ann; 11) Cuckoo Bird; 12) Alabama Jubilee/Down Yonder; 13) Santa Anna’s Retreat; 14) Twin Sisters; 15) Wild Bill Jones; 16) Little Rabbit/Sheep Shell Corn; 17) Berkeley March/Under the Double Eagle; 18) Hand In Hand. Wade relies on Mike Craver’s almost circus-like pump organ texture to create his folk version of a wall of sound that holds together many of the tunes and songs he has chosen. He also lets other musicians shine as much as his own banjo sparkles—Danny Knicely on mandolin and bass, James Leva on fiddle, Russ Hooper on Dobro, and a great flat-picker Zan McLeod. The pump organ’s distinctive and evocative atmospherics pull you into a sense of not just listening from a single point of entry but rather of taking a journey into a land you may once have imagined but only now been able to realize. As familiar as Wade makes this musical territory sound, trust me—you haven’t been here before—at least not in any old-time or bluegrass group I have heard. It has flourishes of remembrances of things past—such as John Herald’s seminal guitar flat-picking in The Greenbrier Boys, or Mike Seeger’s neo-primitive fretless banjo solos in The New Lost City Ramblers, or even Roscoe Holcomb’s high lonesome tenor vocals. But Stephen Wade’s arrangements are so seamlessly integrated, and his fellow musicians so accomplished, that as Coleridge once defined great poetry, the whole is greater than the sum of its parts. You soon realize that you are listening not just to great folk music, but to great music that has elements of folk in it, like Aaron Copeland’s Appalachian Spring. And though it never leaves folk music behind, it pulls it into new territory that has awaited this great explorer like the Pacific Northwest awaited Lewis and Clark. Both the connection to tradition and its compelling surpassing may be seen immediately on picking up this record—on the lovely cover photograph, where one of Stephen Wade’s early banjo heroes and mentors Virgil Anderson looks you proudly in the eye with his right hand curled over the banjo head, while standing just next to him with his left hand curled around the banjo neck to complete the illusion of one banjo player is a young Stephen Wade—with his eyes shyly closed and a mischievous smile, dreaming, as Yeats described his voyage in Sailing to Byzantium, of what is past, or passing, or to come. Masquerading in these early days as a student who wanted merely to master and carry on the tradition, in this late masterpiece, Wade has finally stepped out of their long shadow and clearly become the original artist whose inclusive vision holds both in his hands. Yes he honors, ennobles and celebrates the past, but make no mistake, the man whose banjo this has become has followed his own drummer. Ever in search of sources, Stephen Wade has become a source.